You might think of afternoon tea—tea with a light repast of sandwiches, pastries, scones, and sweets—as a quintessentially elegant British tradition that occurs daily in fine houses like the fictional Downton Abbey or the Ritz in London, miles, and worlds, away from Vancouver, British Columbia. But this old tradition has been enjoying a renaissance in Vancouver over the last several years. The top spots to have a spot of afternoon tea in Vancouver have modeled their service on classic European afternoon teas but add their own unique, regional flavor to this legendary afternoon break, making the experience elegant and hip at the same time. Vancouver being Vancouver, you'll also find plenty of quirky spots serving up themed afternoon teas or an east-meets-west twist on traditional to create a unique experience for visitors. The best spots for afternoon tea in Vancouver vary in setting and price, but they all share one thing in common: delicious tea and gourmet goodies for two or more people. Share afternoon tea with friends and family or make it part of your special occasion celebrations; it's a great choice for birthdays, special events, and Mother's Day. Arguably the most elegant afternoon tea in Vancouver, Afternoon Tea at the Castle was a tradition at the Fairmont Hotel Vancouver and a real treat for traditional "high tea" aficionados and Anglophiles. The tea service included exclusively blended Fairmont teas, petite sandwiches, pastries, house-made scones, and fresh strawberries with Devonshire cream. Now the hotel's new Notch8 Restaurant + Bar offers a different twist on traditional afternoon tea with a 'mad scientist' approach that includes chocolate BLT finger sandwiches and gold popping candy sables. Themes switch out every couple of months from fairytales to TV shows. Afternoon Tea at the Fairmont Hotel Vancouver also has a special pedigree when it comes to tea services: The most famous tea service in British Columbia is the afternoon tea at their sister hotel in Victoria, the Fairmont Empress Hotel. Truffles Fine Foods has a more modest interior than the other spots on this list, but its location is top-notch: It's located inside the Visitor's Centre at the VanDusen Botanical Garden, one of the most beautiful gardens in British Columbia. Have tea overlooking VanDusen's Livingstone Lake with a tea service that includes sandwiches and panini, sweet and savory scones (plus honey farmed from VanDusen's own bees), coconut macaroons, shortbread cookies, French macarons, and petit-fours. Don't miss the VanDusen private-label black tea, which was specially blended for the garden in honor of the visit of HRH Duchess of Cornwall in 2010. One of the hottest spots for afternoon tea in Vancouver is the Adonia Tea House in Kerrisdale. 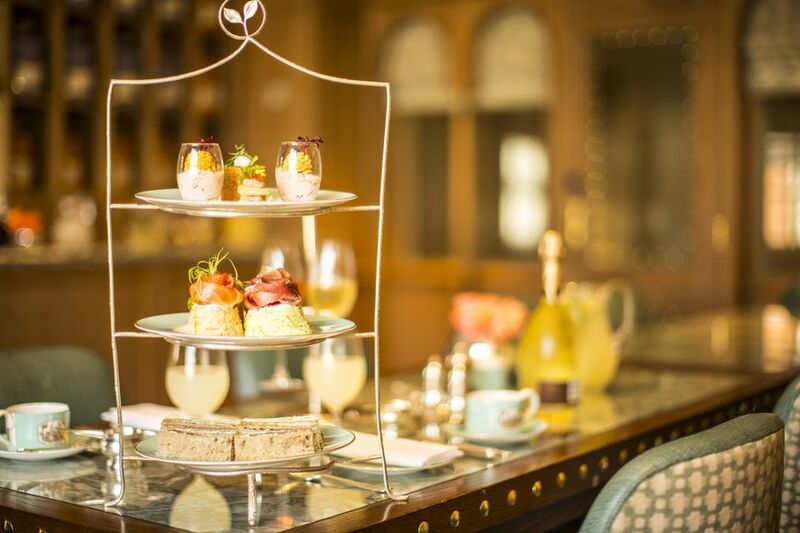 Patterned on traditional English teas, visitors can choose either the full afternoon tea, which comes with finger sandwiches, scones, and fresh-baked pastries or the mini afternoon tea. Located in Yaletown in a Queen Anne Victorian heritage home, Patisserie Fur Elise is a tea salon that will appeal to folks who like their tea service ultra-feminine and dainty. Afternoon tea here includes savories and sweets plus housemade conﬁture and local berry honey from British Columbia. Afternoon tea at TWG Tea Salon has a West (Canadian) Coast twist: It includes such offerings as Japanese miso maple sablefish, sencha-infused scallop tempura roll, lemon bush tea infused mousse tart, and a blend of green teas. Enter a whimsical world of fairytale fun at Neverland Tea Salon, which was created by two childhood friends who have a background in film and an eye for imaginary details. From Tinkerbellle Tea for Kids to a range of 'tipsy teas' for adults, the quirky tea shop is a must-visit for an afternoon tea with attitude. Cotton candy bonsai trees and cute Asian-inspired boxes accompany afternoon tea here when you choose from an east or west inspired adventure. Western style afternoon tea includes traditional sandwiches such as smoked salmon and the eastern menu features delicacies like braised pork bao.